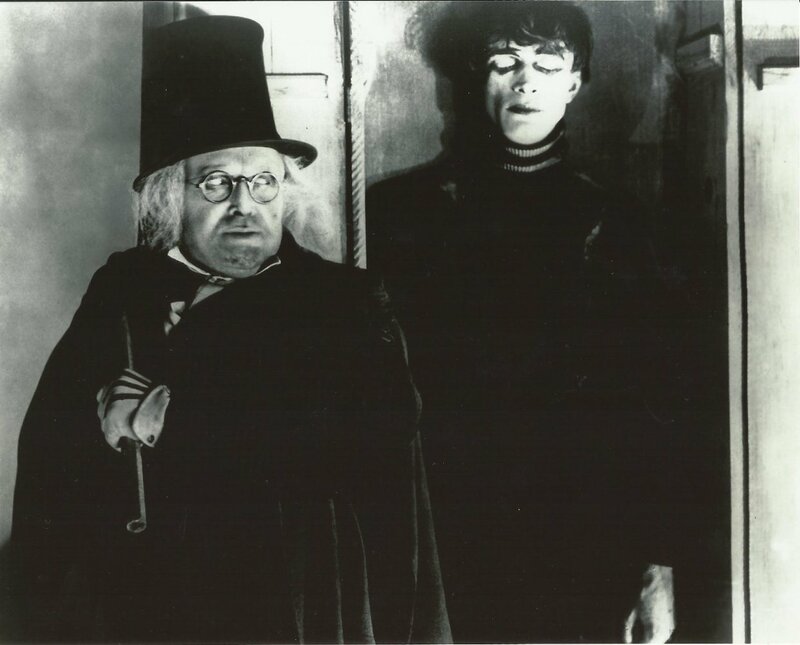 The Cabinet of Dr. Caligari is far from scary, but it is a horror film. It doesn't use gimmicky jump scares or guts and gore to drive its point home. While that's mainly because of the limitations of making movies during the early stages of cinema, it is because of these reasons that the film does what it does so well. Much like films like Gone Girl, Black Swan or Shutter Island, the fear lies in our own imaginations. The fear comes from the fact, that throughout the length of the film, everything we've come to know is all a lie and the person feeding us these lies is none other than our main character. The aspect of the "unreliable narrator" is not a uncommon trope. In both literature and film alike, it's a trope used to trick the audience based on their expectations of how they feel a situation will eventually play out. It's a troupe also used to expose the true nature of the human beings we've just come to know, but in a way that is so deceptive and intriguing it tells more about them that a mere description would. The unreliable narrator is someone whose words we cannot take at face value. This may be for reasons such as insanity, immaturity or lack of knowledge of the situation, but in end, they've duped us and it's that shock value from the "big reveal" that makes this kind of trope work so well. These people blur the lines between fiction and reality even within a fictional world because while the world they're in doesn't inherently exist, it springs to life the more we become invested in the story. And the uneasy feeling comes from being told that what we know and believe to be real is, in fact, the complete opposite. In The Cabinet of Dr. Caligari, Francis is our unreliable narrator. He and his friend go to a festival and meet Dr. Caligari and his sleepwalking companion, Cesare, who can supposedly see into the future. Francis' friend goes up to get his fortune told only to have the sleepwalking man tell him that he's going to die that night. And unfortunately, that's what happens. This sends Francis off on a mission to find out who killed his dear friend. As we follow Francis in his endeavors, what ends up being the truth never comes to mind. How could the man we've come to know and root for be the catalyst behind this mind-boggling search? We're so distracted by the mystery surrounding this murder and these bizarre, jaggedly designed sets that we never see the truth coming even though it was right in front our faces. Like Francis throughout a majority of the film, we too, are put in a state of delusion. However, there's always a time that comes where we have to wake up from that delusion and face reality. This happens at the end of the film when Francis when he realizes that he murdered his friend and the insane asylum that he was searching for the murderer in is his home and it's run by none other than Dr. Caligari. Even though there eventually comes a time that we have to face reality, it was reality that drove poor Francis into that daze in the first place. He doesn't mean to lie to us. His version of the truth is skewed simply because he can't accept that he murdered his friend. He made up this story in his head to cope with the truth and that story is the one that we'd been following up until that point. In Shutter Island, our main character, Teddy (Leonardo DiCaprio), is a man who we follow as he and his comrade (Mark Ruffalo) try to track down the murderer of his wife (Michelle Williams). And similarly to Francis' situation, as we follow him, the idea that he could've murdered his wife never comes to mind. In the end, it's revealed that the story we've been following is all a delusion that Teddy's invented in order to cope with the fact that he's the one who murdered his wife. Sound familiar? In both films, we're directly placed in the perspective of our narrators. It's because of this that we tend to overlook the things that just don't seem to be right like the jagged buildings, the roads that seem to go nowhere and even the irregular character behaviors of people like Francis' girlfriends who is just plain weird or the guards of the Shutter Island asylum who don't seem to care that there's a murderer on the loose on this island. And in both films, these fictional situations are presented as reality. However, when each twist actually occurs, the fictional situations become just that...fictional. Francis and Teddy, are mentally ill. Their crimes have scarred them to the point that they have to create a new reality in order to cope with the original one. Even though the new reality doesn't inherently exist, it,a again, becomes alive the more we become invested in it and we are, which is why the twist is so effective. It's the twist that makes the true reality come to light, destroying the one we were originally attached to and that frightens us. Wiene's story is one of a madman framed involving these huge, bizarre Expressionist sets in order to introduce us to Francis' delusional mind. However, we just don't see that connection until the end of the film. The same goes for Teddy in Scorsese's Shutter Island. These types of characters pick and choose what they want to believe and build a world based off of those things and as a viewer, we have no choice than to follow them along and believe as they do that the situation is real. It's like a magician's trick. They show us something and tell us it's real, but moments later they pull something else out of their sleeve and we're left mesmerized because of this person's ability to pull the wool over our eyes. Why we're so mesmerized by being fooled is something I could not tell you about, but it's because of this that the unreliable narrator troupe works and why it will continue to until we change.